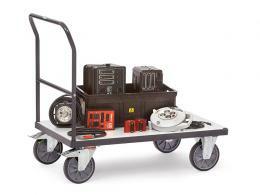 What is the purpose of the ESD Modular Platform Cart? The ESD Modular Platform Cart makes carrying heavy objects up to 500kg easy with its sleek structure and easy-to-use specifications. This heavy duty platform trolley is easy to load and can be pulled across any surface with ease. The flatbed makes stacking boxes and other items easy and hassle-free, and when loaded correctly, greatly reduces the possibility of dropping or spilling your load. 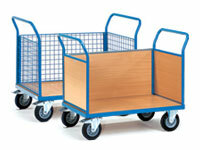 This is the perfect type of trolley to use all across the shipping and packing industry. It is a great tool to use to transport heavy objects down hallways and all across the facility. This type of pull along trolley is also the perfect piece of equipment to use in facilities that involve elevators. 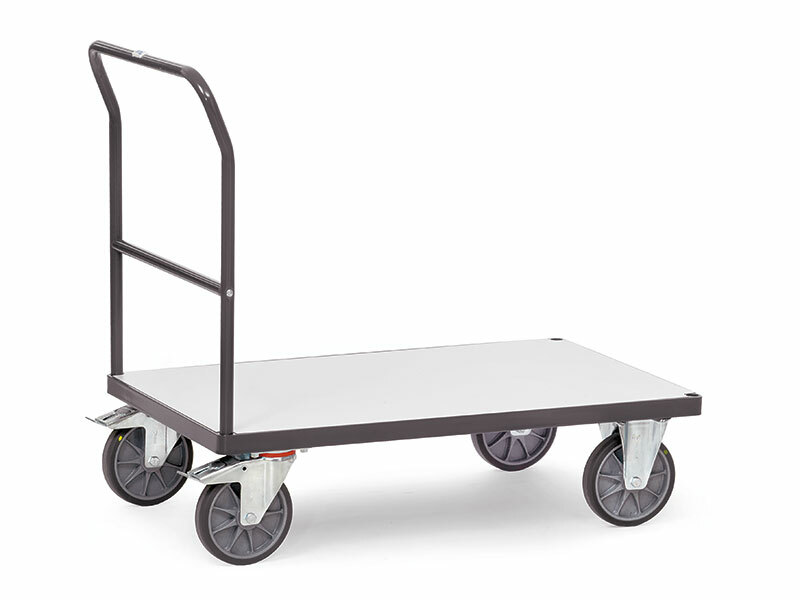 The ESD platform cart dimensions are compact enough to fit in and out of elevators with ease, but large enough to transport the items you need in one trip, instead of many small ones. 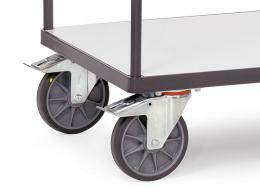 This is the perfect flatbed trolley cart for anyone who does any transportation of goods within their work place. No special training is required to use this product, but precautions should always be taken when transporting heavy loads. The strength of the individual should be taken into consideration if lifting is required and every employee should follow safe lifting guidelines when using the platform cart. Made with tubular and sectional welded steel along with screw and plug type construction; this platform cart is extremely durable and easy to use. It features an HPL composite shelf as well as two brake swivel and two fixed non-marking grey TPE wheels. It is dark grey with a light shelf. For the added ease of staying organized, you can also purchase a clipboard accessory so you can easily keep track of your entire inventory. Delivery is free to all UK mainland destinations and the product comes with a 10 year parts and labour warranty.